UPSC has scheduled the CDS Examination (I) 2014 for 9th February 2014 . The application process starts on November 2, 2014 and the last date for applying online is December 22, 2013. Before applying the candidates have to ensure that they fulfill the eligibility criteria. The Combined Defence Services Exam is an Gateway to the Defence Forces for admission to the Indian Military Academy , Naval Academy , The Airforce Academy and the Officer Training Academy at the Graduate Level. Entry at the Undergraduate level is through the National Defence Academy which conducts the NDA Exam twice a year. 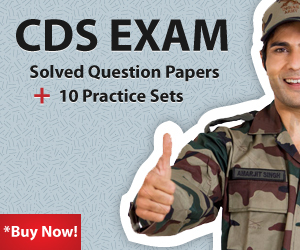 How to start preparation for UPSC CDS exam ?